James Wolfe and Louis-Joseph Montcalm both came from families who for centuries had served in their country’s armies: the Wolfes in Wales, Ireland and finally England; the Montcalms in France. When these two men faced each other on the Plains of Abraham, they had a lot riding on the outcome. In this book, Roch Carrier gives us careful background details of the events leading up to the famous day in September l759. The Seven Years War had seen fighting between the French and English including Wolfe’s success in taking Louisburg. The question was how to take Quebec City. For some time the Governor General Vaudreuil, who was in charge of the troops in Quebec, had not got along with the commander from the troops sent from France, Louis-Joseph Montcalm. 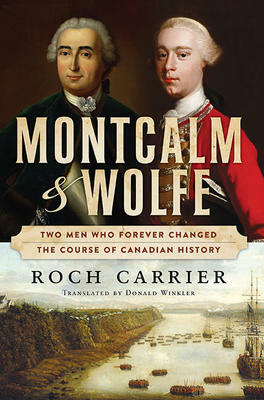 In the most exciting part of this book, Carrier describes Wolfe’s decision to scale the tall cliff overlooking a farmer’s field owned by Abraham Martin and allow the rest of the British army to climb the cliff behind and attack the French troops under Montcalm who was not prepared for these tactics. Carrier describes the two warriors: Wolfe very tall and skinny and often ill, especially from sea-sickness, attached to his mother for remedies; Montcalm steadier, with a family waiting for him in France. Carrier himself is one of Canada’s finest writers as novelist, playwright and children’s author. He is also the former director of the Canada Council for the Arts and the National Librarian of Canada. The translator, Donald Winkler, has won the Governor General’s Award for French to English Translation three times. In this book, they have a winner.